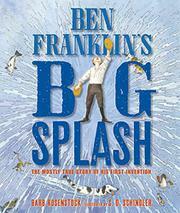 Is another picture book about Ben Franklin really needed? The answer is yes, as unlike many of its predecessors, this one takes a fresh approach by focusing on a single childhood fascination—swimming. As a boy, Ben was unusual in that he loved to swim at a time when it was thought that swimming caused sickness. Ben's frustration was that he could not swim like a fish, and true to his nature, he searched for a solution, one that would enable him to swim like a fish. He first made swim fins out of wood and string (they looked like a painter’s palettes), then swim sandals. Emphatic, alliterative verbs accentuate both his enthusiasm and his methodical nature: “Ben SPRINTED straight to the river, STOOD on the bank, STRIPPED OFF his clothes, STRAPPED his feet into the sandals, STUCK his thumbs back in the swim fins, SPREAD his arms wide, STOMPED his feet, and SPLASHED IN.” This first discovery would lead to bigger and better scientific creations. The finely detailed ink-and-watercolor illustrations, varying type sizes and colors, and clever page design effectively and delightfully depict this significant American scientist. (Schindler deftly keeps Ben's privates underwater.) While the subtitle claims the book is “mostly true,” the backmatter provides solid information.